New LinkedIn Profile is good (for Recruiters)! The LinkedIn haven’t really updated the Profile section for far too long time. It become a bit archaic in fact, so a new profile is really welcome. It is far easier to read and more importantly scan, as we consume the web sites. It also tells you far more about the person than the any older LinkedIn Profile version did. By looking at the graphical representation of your LinkedIn connections grouped by and industry the recruiter can quickly get what type of people the candidate is connected to on the social network. It tells a lot about the person when you can see what schools are the people his connections are from. What companies do the candidates contacts work for is priceless. Location and industry profiles of the candidates LinkedIn contacts just add to the complete picture of a candidate. All this data combined gives you very quickly a profile of the candidate’s connections. This data can help a recruiter profile a candidate much better than by just looking at a very static data, a document like a CV or the (old) LinkedIn profile. 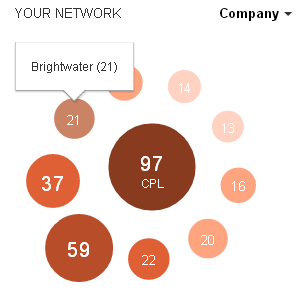 Where LinkedIn could improve the display is in including what the number represent as opposed to displaying just the number of the connections in each group. It is annoying to have to put a mouse over each circle to find out what company or country the contacts are from. A tag cloud would be far more usefully display. A company name printed and on mouse over the exact number of the connections in that company? Would you agree? Linkedin was getting stale. This change will no doubt be for the positive. But for whom? Personally speaking my own circle is not so big being surrounded by alot of non professionals. Which could be to my detriment! Next Next post: Are Recruiters any different than Irish Economists?